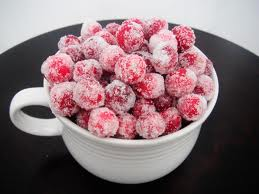 I have the perfect easy family activity for today; sugared cranberries. Watch out! They are like potato chips. I bet you can’t eat just one. combine 2 cups water and 2 cups sugar in a saucepan and bring to a simmer. DO NOT BOIL! Add the cranberries and let cool for at least 2 hours. You can refrigerate overnight. In batches, roll cranberries in sugar. Place on wax paper to dry for about an hour. While they are getting ready go for a family hike and get in those 10,000 steps. How many different types of leaves can you find? Super easy. Super yummy and pretty too.